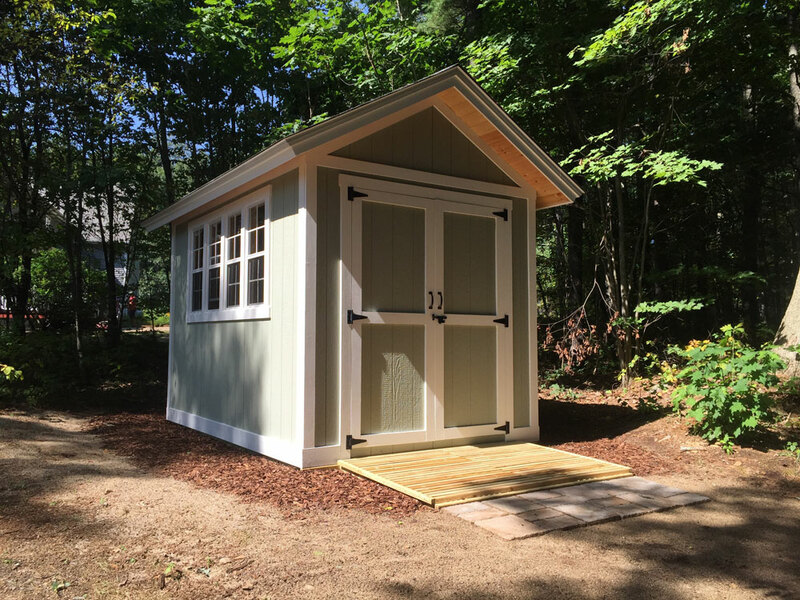 8ft x 12ft garden shed with four windows and a five foot double door. The location was a challenge, i.e. one side of the shed on the edge of a very soft Leach field overflow, the other in forest dirt, and one corner on ledge. The site is not accessible with heavy equipment due to possible damage to other sensitive areas of the yard. 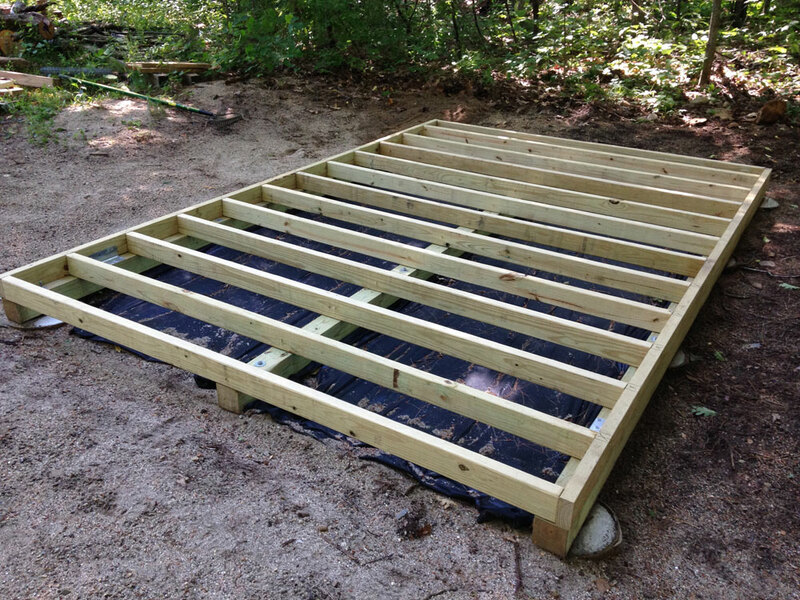 I made a base with 2″x4″x8′ pressure treated lumber and sat it on a foundation made of 4″x4″x12′ pressure treated lumber attached to 12 concrete piers. The piers were made of 10″ and 12″ sonotubes. None of the piers extend below frost line but they were ideal for leveling the base on a very uneven ground. Part of the ground is very soft, hence, 10″ and 12″ dia. piers. 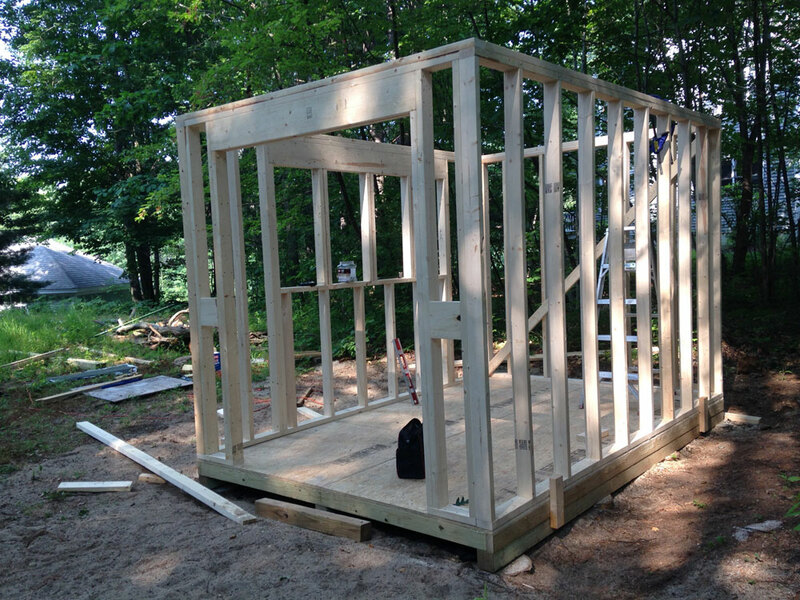 I think I overbuilt the foundation a bit, but better safe than sorry. 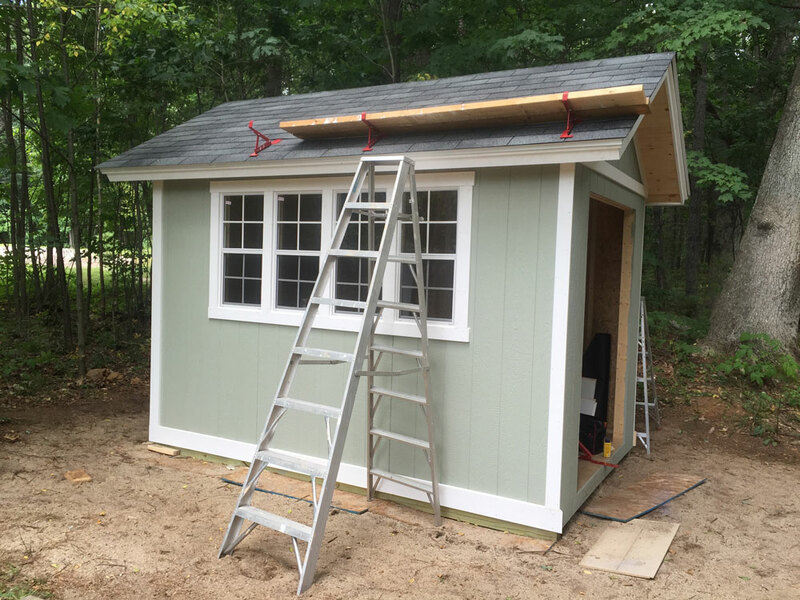 To add light into the shed I purchased four 18″x36″ double hung windows on the internet with safety glass and aluminum frames. They were ideal for this type of construction. I elected not to use Cedar wood for the trim pieces in order to save cost. All the trim pieces are of pine wood. After the two coat of paint the knots began bleeding through the paint. A shellac from Sherwin Williams took care of the problem and I believe the bleeding from the knots is contained at least for a while. 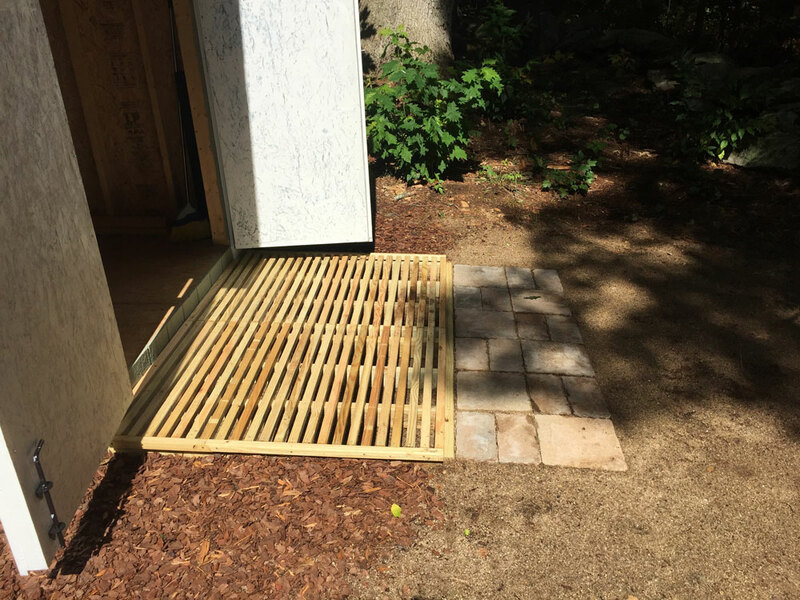 Because the ground is all dirt I found it necessary to build a ‘grate’ in front as a place to clean footwear and equipment before entering – 2″x2″ pressure treated wood spaced ¾” apart did the job. To prevent backsplash of dirt on to the walls in a rainstorm I spread ‘Pine Bark Nuggets’ around the shed foundation. We had a heck of a rainstorm last night and the pine bark did the job with flying colors, no mud on the walls and only little evidence of splashing. 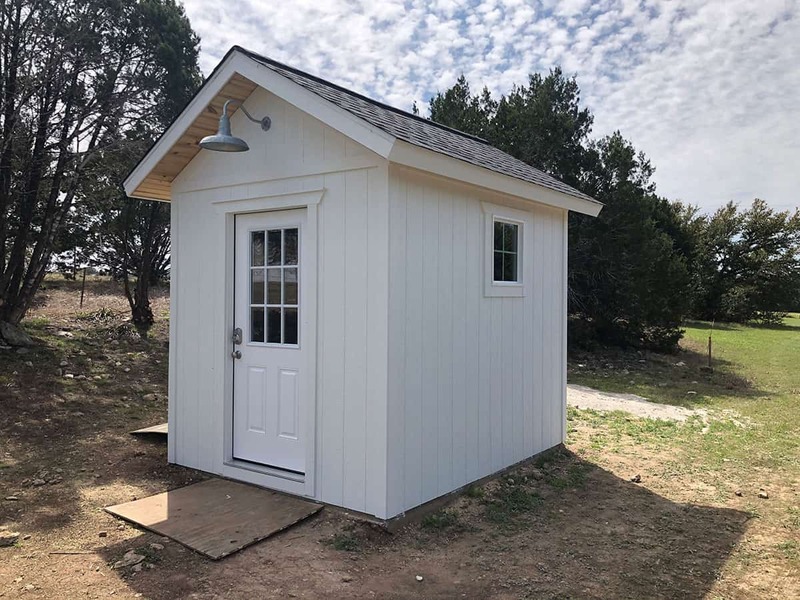 The additional cost for building an 8ft x 12ft shed as opposed to an 8×10 is not very significant and since the footprint remained below 100 sq.ft. no building permits were needed here in this town. 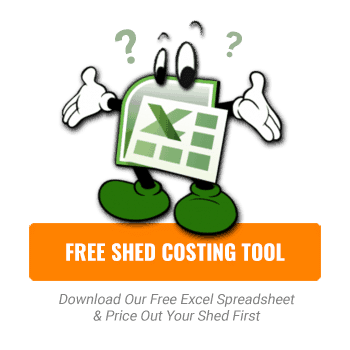 All told the cost in materials for the shed came in under $US 2,600. What plan did you use? 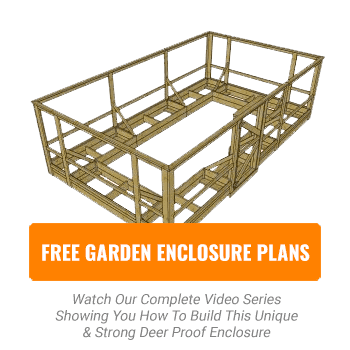 The 8 x 8 shed? 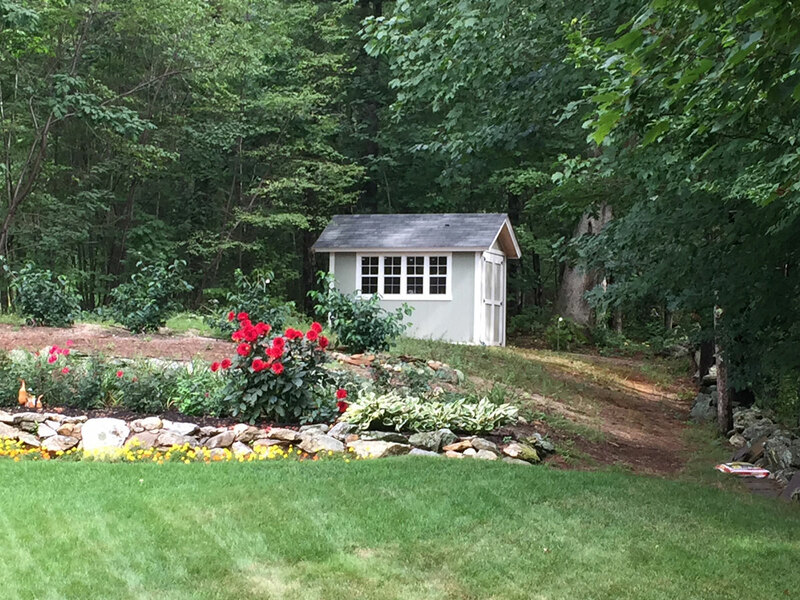 Very nicely done Svend… Looks great sitting up on the hill in front of the flower garden. Almost like a little cottage in the woods.